Home » What is Trigeminal Neuralgia? Trigeminal neuralgia (TN) is considered to be one of the most painful afflictions known to medical practice. TN is a disorder of the fifth cranial (trigeminal) nerve. The typical or “classic” form of the disorder (called TN1) causes extreme, sporadic, sudden burning or shock-like facial pain in the areas of the face where the branches of the nerve are distributed – lips, eyes, nose, scalp, forehead, upper jaw, and lower jaw. The pain episodes last from a few seconds to as long as two minutes. These attacks can occur in quick succession or in volleys lasting as long as two hours. The “atypical” form of the disorder (called TN2), is characterized by constant aching, burning, stabbing pain of somewhat lower intensity than TN1. Both forms of pain may occur in the same person, sometimes at the same time. The trigeminal nerve is one of 12 pairs of nerves that are attached to the brain. The nerve has three branches that conduct sensations from the upper, middle, and lower portions of the face, as well as the oral cavity, to the brain. (See Figure 1) More than one nerve branch can be affected by the disorder. Rarely, both sides of the face may be affected at different times in an individual, or even more rarely at the same time (called bilateral TN). 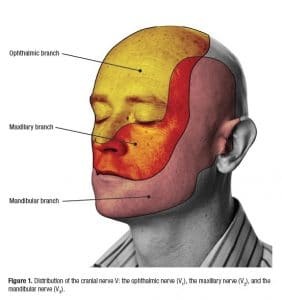 Figure 1: Distribution of the 5th Cranial Nerve: Disorders of the Maxillary and Mandibular Branches Can Present as a Toothache Causing Patients to Seek Dental Treatment. TN is associated with a variety of conditions. It can be caused by a blood vessel pressing on the trigeminal nerve as it exits the brain stem, which prompts the wearing away or damage to the protective coating around the nerve (the myelin sheath). The intense flashes of pain can be triggered by vibration or contact with the cheek (such as when shaving, washing the face, or applying makeup), brushing teeth, eating, drinking, talking, or being exposed to the wind. People with TN avoid social contact and daily activities such as eating and talking because they fear an attack. Pain from TN is frequently very isolating and depressing for the individual. Depression and sleep disturbance may render individuals more vulnerable to pain and suffering. Thus, there are individual, family, and societal costs of TN. TN diagnosis is based primarily on the person’s history and description of symptoms, along with results from physical and neurological examinations. Because of overlapping symptoms and the large number of conditions that can cause facial pain, obtaining a correct diagnosis is difficult, but finding the cause of the pain is important as the treatments for different types of pain may differ. Pharmacological treatment options include anticonvulsant medications used to block nerve firing and tricyclic antidepressants used to treat pain. Common analgesics and opioids are not usually helpful in treating the pain. The condition is progressive. The attacks often worsen over time, with fewer and shorter pain-free periods before they recur. Eventually, the pain-free intervals disappear and medication to control the pain becomes less effective. Patients opt to have surgery which may or may not be effective. Pain free periods after surgery vary. Sometimes surgery exacerbates the pain. More information on Trigeminal Neuralgia and related facial pain diseases is available in our FPA Guide. Contact FPA at info@tna-support.org or call 1-800-923-3608.